Imagine your phone projected to the big screen: a dream made reality using Smart View. Watch videos and photos from your Note8 on your TV screen. It’s simple to connect your phone to a TV with Smart View. Connect to Samsung Smart TVs and Miracast devices (such as Chromecast or Amazon Fire TV Stick), and you can wirelessly beam photos, videos, presentations, and even video games to your big screen. You’re headed for the big time. Start dreaming big by connecting your phone to your TV. Note: If your screen keeps turning off, change your screen timeout settings by navigating to Settings > Display > Screen Timeout. 2. To view the second panel, swipe to the left. 3. Touch the Smart View icon. 4. If required, touch the device you want to display your screen on. The connection is usually established automatically if there is only one compatible device available. Depending on the TV, you will need to enter a PIN or allow access to complete the connection. Note: Make sure your TV is turned on and connected to the same Wi-Fi network as your device before turning on Smart View. Some TVs and devices may require you to switch inputs or turn on screen mirroring. 5. To disconnect Smart View, touch Disconnect. Note: If the Smart View Control is minimized, touch it to list the menu. 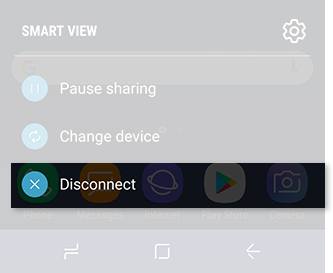 Smart View Control only shows up on your phone.